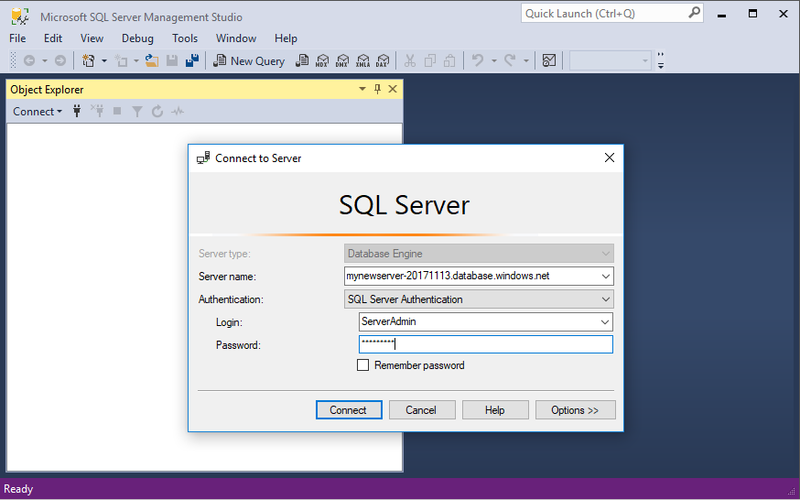 Before you begin this tutorial, download and install the newest version of SQL Server Management Studio (SSMS). 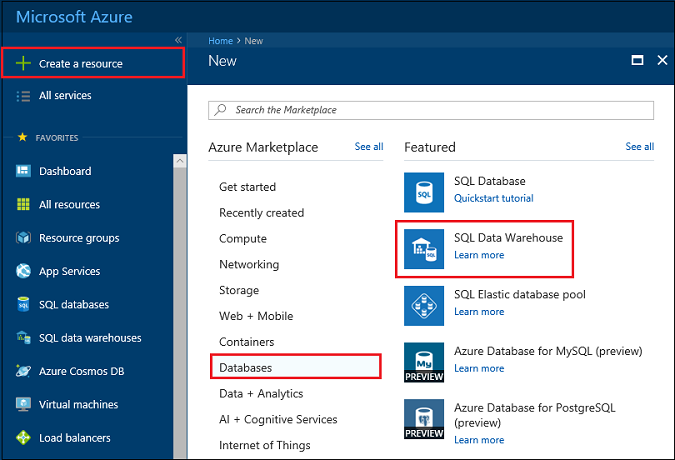 An Azure SQL data warehouse is created with a defined set of compute resources. The database is created within an Azure resource group and in an Azure SQL logical server. Follow these steps to create a blank SQL data warehouse. 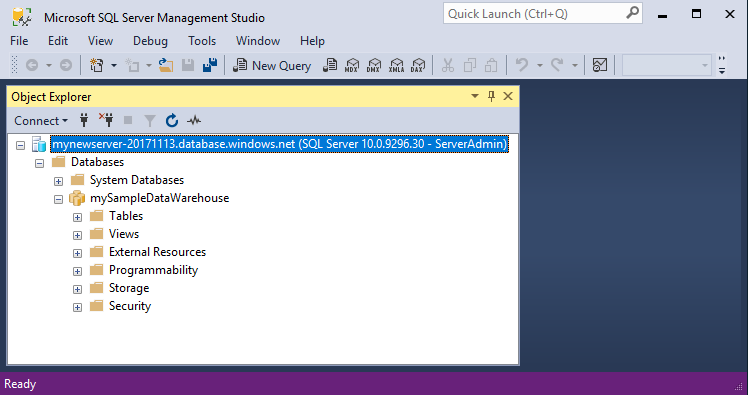 Select Databases from the New page, and select SQL Data Warehouse under Featured on the New page. Database name mySampleDataWarehouse For valid database names, see Database Identifiers. Subscription Your subscription For details about your subscriptions, see Subscriptions. Resource group myResourceGroup For valid resource group names, see Naming rules and restrictions. Select source Blank database Specifies to create a blank database. Note, a data warehouse is one type of database. Password Any valid password Your password must have at least eight characters and must contain characters from three of the following categories: upper case characters, lower case characters, numbers, and non-alphanumeric characters. Click Performance level to specify whether the data warehouse is Gen1 or Gen2, and the number of data warehouse units. For this tutorial, select Gen2 of SQL Data Warehouse. The slider is set to DW1000c by default. Try moving it up and down to see how it works. Now that you have completed the SQL Database form, click Create to provision the database. Provisioning takes a few minutes. The SQL Data Warehouse service creates a firewall at the server-level that prevents external applications and tools from connecting to the server or any databases on the server. To enable connectivity, you can add firewall rules that enable connectivity for specific IP addresses. Follow these steps to create a server-level firewall rule for your client's IP address. SQL Data Warehouse communicates over port 1433. If you are trying to connect from within a corporate network, outbound traffic over port 1433 might not be allowed by your network's firewall. If so, you cannot connect to your Azure SQL Database server unless your IT department opens port 1433. After the deployment completes, click SQL databases from the left-hand menu and then click mySampleDatabase on the SQL databases page. The overview page for your database opens, showing you the fully qualified server name (such as mynewserver-20180430.database.windows.net) and provides options for further configuration. Copy this fully qualified server name for use to connect to your server and its databases in subsequent quick starts. Then click on the server name to open server settings. Click the server name to open server settings. Click Show firewall settings. The Firewall settings page for the SQL Database server opens. Click Add client IP on the toolbar to add your current IP address to a new firewall rule. A firewall rule can open port 1433 for a single IP address or a range of IP addresses. Click Save. A server-level firewall rule is created for your current IP address opening port 1433 on the logical server. You can now connect to the SQL server and its data warehouses using this IP address. The connection works from SQL Server Management Studio or another tool of your choice. When you connect, use the ServerAdmin account you created previously. By default, access through the SQL Database firewall is enabled for all Azure services. 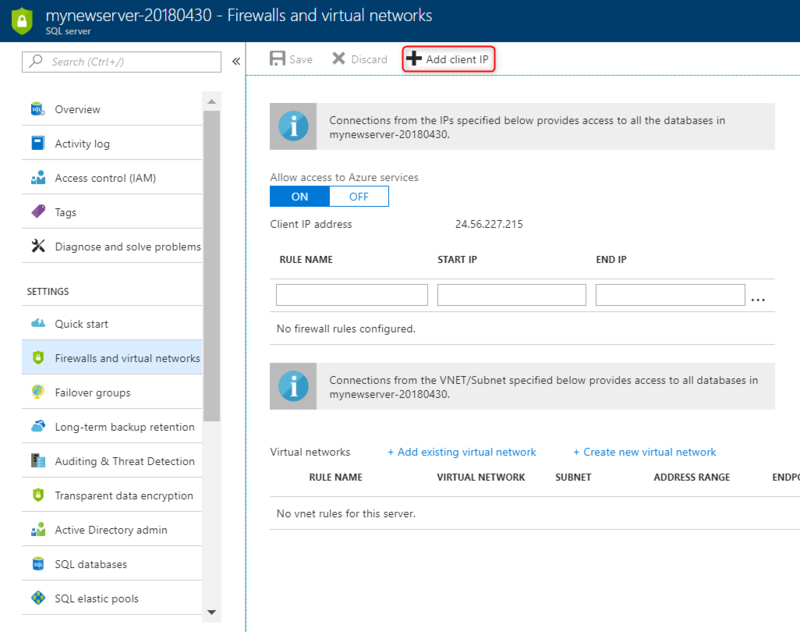 Click OFF on this page and then click Save to disable the firewall for all Azure services. Get the fully qualified server name for your SQL server in the Azure portal. Later you will use the fully qualified name when connecting to the server. Select SQL Data warehouses from the left-hand menu, and click your database on the SQL data warehouses page. In the Essentials pane in the Azure portal page for your database, locate and then copy the Server name. In this example, the fully qualified name is mynewserver-20180430.database.windows.net. 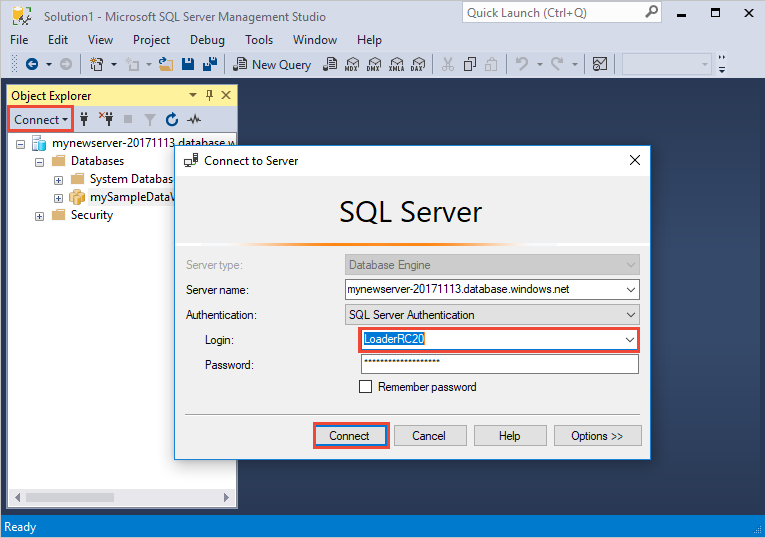 This section uses SQL Server Management Studio (SSMS) to establish a connection to your Azure SQL server. Server name The fully qualified server name The name should be something like this: mynewserver-20180430.database.windows.net. Authentication SQL Server Authentication SQL Authentication is the only authentication type that we have configured in this tutorial. In Object Explorer, expand Databases. 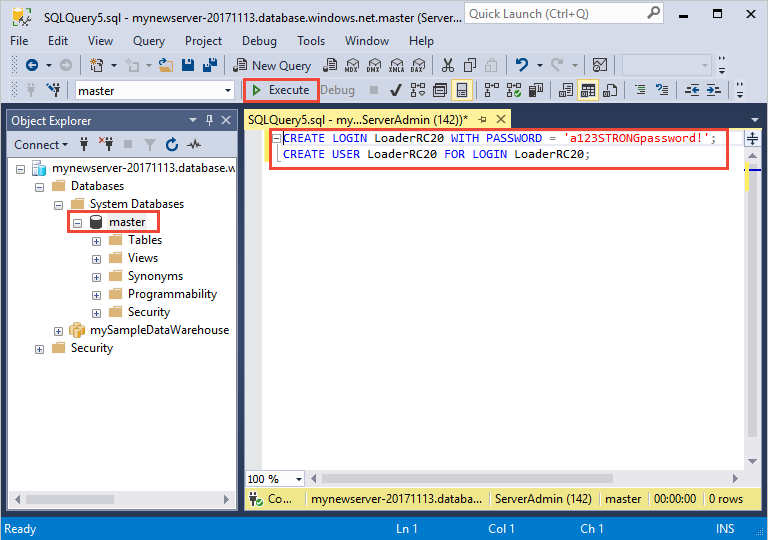 Then expand System databases and master to view the objects in the master database. Expand mySampleDatabase to view the objects in your new database. The server admin account is meant to perform management operations, and is not suited for running queries on user data. Loading data is a memory-intensive operation. Memory maximums are defined according to which Generation of SQL Data Warehouse you've provisioned, data warehouse units, and resource class. It's best to create a login and user that is dedicated for loading data. Then add the loading user to a resource class that enables an appropriate maximum memory allocation. Since you are currently connected as the server admin, you can create logins and users. Use these steps to create a login and user called LoaderRC20. Then assign the user to the staticrc20 resource class. In SSMS, right-click master to show a drop-down menu, and choose New Query. A new query window opens. In the query window, enter these T-SQL commands to create a login and user named LoaderRC20, substituting your own password for 'a123STRONGpassword!'. Right-click mySampleDataWarehouse, and choose New Query. A new query Window opens. 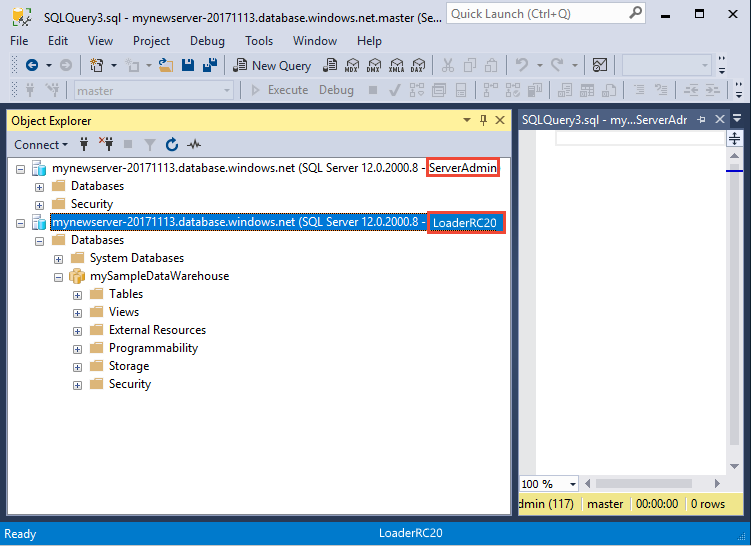 Enter the following T-SQL commands to create a database user named LoaderRC20 for the LoaderRC20 login. The second line grants the new user CONTROL permissions on the new data warehouse. These permissions are similar to making the user the owner of the database. The third line adds the new user as a member of the staticrc20 resource class. The first step toward loading data is to login as LoaderRC20. In Object Explorer, click the Connect drop down menu and select Database Engine. The Connect to Server dialog box appears. Enter the fully qualified server name, and enter LoaderRC20 as the Login. Enter your password for LoaderRC20. When your connection is ready, you will see two server connections in Object Explorer. One connection as ServerAdmin and one connection as MedRCLogin. You are ready to begin the process of loading data into your new data warehouse. This tutorial shows you how to use external tables to load New York City taxi cab data from an Azure storage blob. 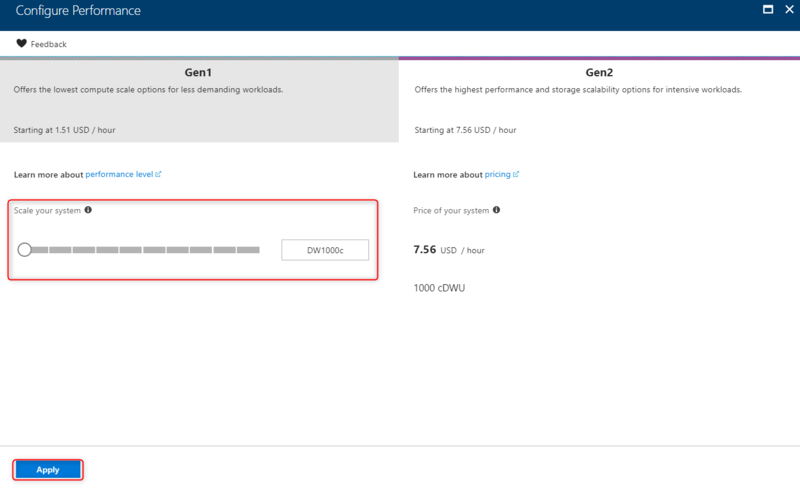 For future reference, to learn how to get your data to Azure blob storage or to load it directly from your source into SQL Data Warehouse, see the loading overview. Run the following SQL scripts specify information about the data you wish to load. This information includes where the data is located, the format of the contents of the data, and the table definition for the data. In the previous section, you logged into your data warehouse as LoaderRC20. 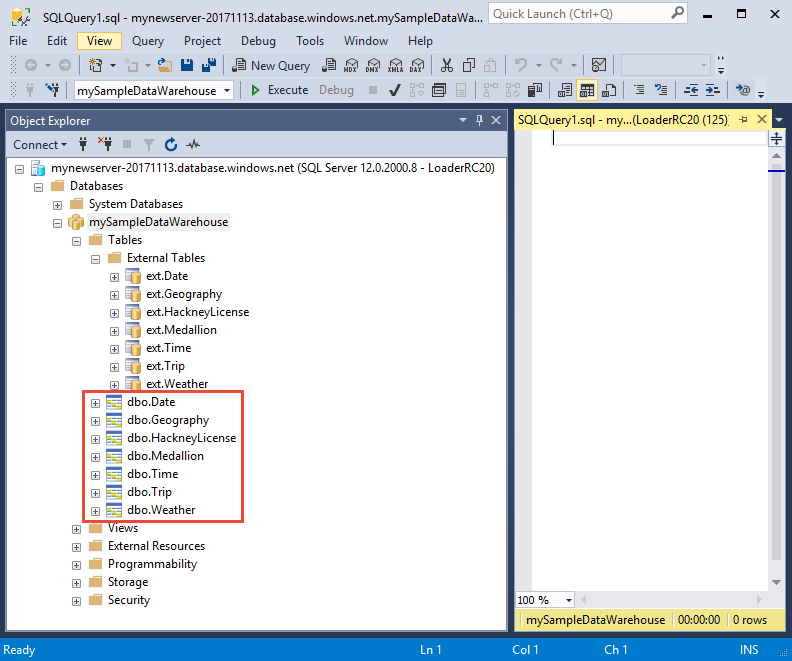 In SSMS, right-click your LoaderRC20 connection and select New Query. A new query window appears. Compare your query window to the previous image. 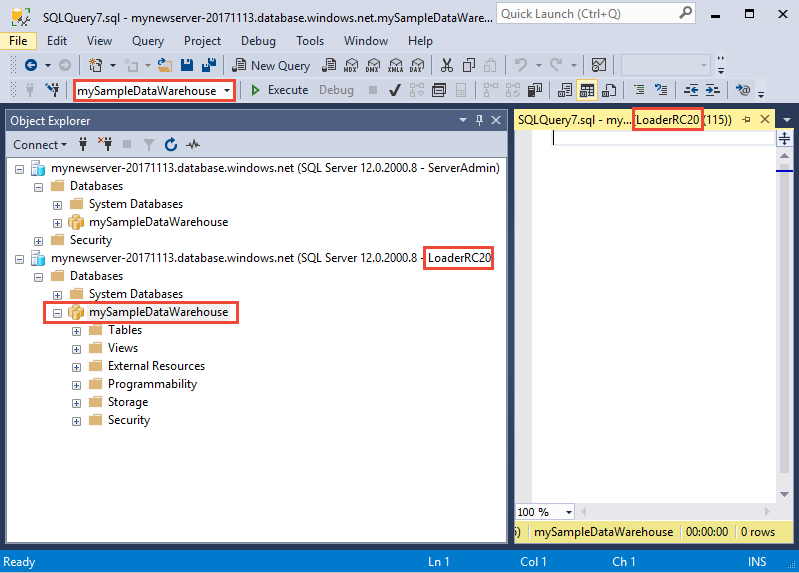 Verify your new query window is running as LoaderRC20 and performing queries on your MySampleDataWarehouse database. 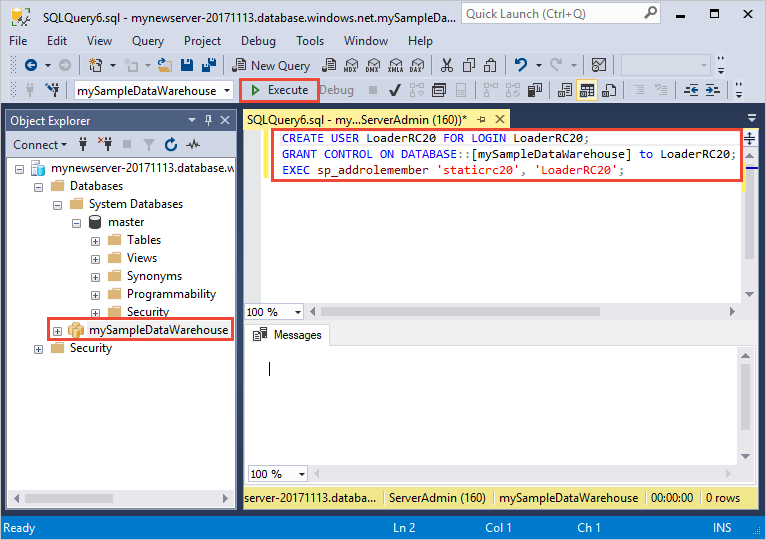 Use this query window to perform all of the loading steps. Create a master key for the MySampleDataWarehouse database. You only need to create a master key once per database. Run the following CREATE EXTERNAL DATA SOURCE statement to define the location of the Azure blob. This is the location of the external taxi cab data. To run a command that you have appended to the query window, highlight the commands you wish to run and click Execute. Run the following CREATE EXTERNAL FILE FORMAT T-SQL statement to specify formatting characteristics and options for the external data file. This statement specifies the external data is stored as text and the values are separated by the pipe ('|') character. The external file is compressed with Gzip. Run the following CREATE SCHEMA statement to create a schema for your external file format. The schema provides a way to organize the external tables you are about to create. Create the external tables. The table definitions are stored in SQL Data Warehouse, but the tables reference data that is stored in Azure blob storage. 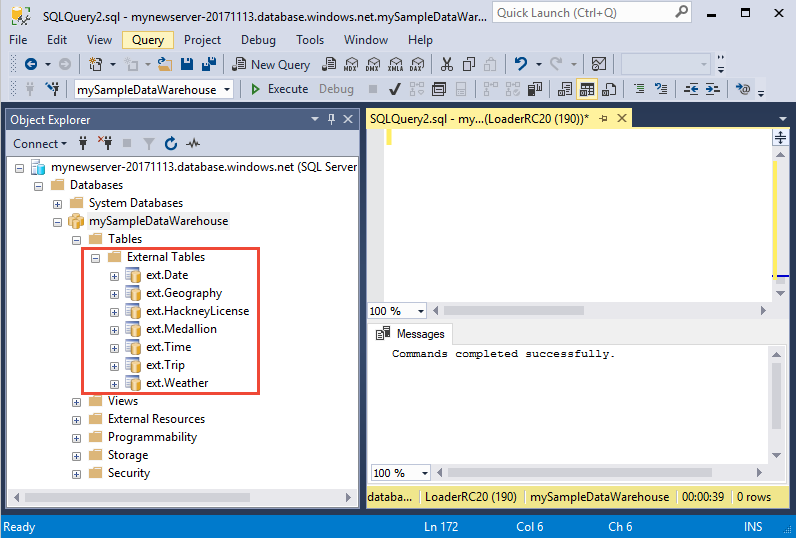 Run the following T-SQL commands to create several external tables that all point to the Azure blob we defined previously in our external data source. In Object Explorer, expand mySampleDataWarehouse to see the list of external tables you just created. This section uses the external tables you just defined to load the sample data from Azure Storage Blob to SQL Data Warehouse. This tutorial loads the data directly into the final table. In a production environment, you will usually use CREATE TABLE AS SELECT to load into a staging table. While data is in the staging table you can perform any necessary transformations. To append the data in the staging table to a production table, you can use the INSERT...SELECT statement. For more information, see Inserting data into a production table. The script uses the CREATE TABLE AS SELECT (CTAS) T-SQL statement to load the data from Azure Storage Blob into new tables in your data warehouse. CTAS creates a new table based on the results of a select statement. The new table has the same columns and data types as the results of the select statement. When the select statement selects from an external table, SQL Data Warehouse imports the data into a relational table in the data warehouse. Run the following script to load the data into new tables in your data warehouse. View your data as it loads. You’re loading several GBs of data and compressing it into highly performant clustered columnstore indexes. Run the following query that uses a dynamic management views (DMVs) to show the status of the load. After starting the query, grab a coffee and a snack while SQL Data Warehouse does some heavy lifting. Enjoy seeing your data nicely loaded into your data warehouse. You are being charged for compute resources and data that you loaded into your data warehouse. These are billed separately. If you want to keep the data in storage, you can pause compute when you aren't using the data warehouse. By pausing compute you will only be charge for data storage and you can resume the compute whenever you are ready to work with the data. If you want to remove future charges, you can delete the data warehouse. Follow these steps to clean up resources as you desire. Log in to the Azure portal, click on your data warehouse. To pause compute, click the Pause button. When the data warehouse is paused, you will see a Start button. To resume compute, click Start. To remove the data warehouse so you won't be charged for compute or storage, click Delete. To remove the SQL server you created, click mynewserver-20180430.database.windows.net in the previous image, and then click Delete. Be careful with this as deleting the server will delete all databases assigned to the server. To remove the resource group, click myResourceGroup, and then click Delete resource group. In this tutorial, you learned how to create a data warehouse and create a user for loading data. You created external tables to define the structure for data stored in Azure Storage Blob, and then used the PolyBase CREATE TABLE AS SELECT statement to load data into your data warehouse. Advance to the migration overview to learn how to migrate an existing database to SQL Data Warehouse.